On DVD this week is the latest Indy adventure. Expectations were high and it has already divided camps. After all, it's a 27 year old franchise and things can never be the same as it was. But since each episode of the series is a standalone adventure with only a few connections between them, "Crystal Skull" automatically had the pressure relieved of, say, the Star Wars prequels to really f* things up. "Crystal Skull" doesn't quite have the same magic as the other films, but it's still a respectable entry in the series and a highly entertaining film. As usual the film begins with a bang. It's 1957, and we're following an Army convoy in the Nevada desert. The Army has kidnapped Indiana Jones and his sidekick George "Mac" McHale (Ray Winstone). Cate Blanchett, hamming up a great Russian accent (Ukrainian actually), leads the Commies in a search for a piece of military treasure hidden away in a very familiar warehouse. An elaborate chase ensues ending with perhaps the most audacious escape from danger Indy's ever faced - a refridgerator never seemed so helpful. 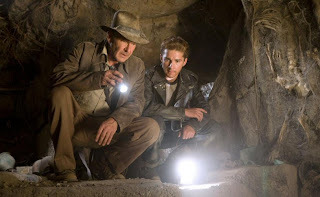 After Indy escapes and travels back home safely to Princeton he's met by a bold youngster named Mutt Williams (Shia LeBeauf doing a great biker-rebel impression) who has been sent by Indy's old archeologist friend Professor Oxley (John Hurt) to find and bring back a mysterious Crystal Skull to its rightful home in the Mayan jungle. Indy meets up with his old flame Marion Ravenwood (Karen Allen) along the way and the foursome travel the globe, discover ancient worlds with supernatural powers while fighting off those nasty Commies. There's a lot of plot in "Crystal Skull" and too much to tell in a review. But the less you know the better, because the biggest strength of this film is it's unfolding story and clever reveals of information. Spielberg and company are wise to tell the story 25 years after the 1930's adventures we're used to. Writer David Koepp also cleverly writes in the Communist scare and the atomic age into the film, and finds new enemies to replace those evil Nazis. Koepp smartly put some quality time into fleshing out Indy's activities between now and then. Let's face it, a 65 year old action hero is not very exciting, but they do the best they can. We never got to see Indy during the war, but we learn that Jones used his worldly skills and knowledge to become a highly decorated spy for the US Government. He's not even called Indiana anymore. He's back to Henry Jones Jr. and instead of traversing the globe in search of treasure he's living comfortably teaching at Princeton. There are plenty of elaborately choreographed actions scenes, some of which triumph, and some are just watchable. The action sores to great heights in the first half, and arguably have decreasing returns as the film moves along. The highlight is the cool motorcycle chase through the Princeton campus, and ending with a great comic punchline in the library. The lowlight is a not-so-well shot swordfight between LeBeauf and Blanchett atop two moving jeeps which segues into a CG-heavy Tarzan-style vine-swingning sequence. On the downside is the overall dillution of the suspense, jeopardy and campy gore of the original three. It's family friendly fare for most of the film. No hearts are ripped from people's chests, and no melting faces. The climax may even turn a lot of people off, as it doesn't have the emotional resonance of "The Last Crusade", or the spine-tingling fear of "Raiders". The fears of Spielberg and Lucas trying too hard to recreate the magic and failing miserably are adequately allayed. It's a grounded film that stands on its own and never falls into pathetic self-parody. "Crystal Skull" successfully blazes its own trail in terms of style, structure, tone and character. Unless you're really cynical, it's guaranteed to entertain. Enjoy. may not be really a cynical, but this movie makes me want to be one.